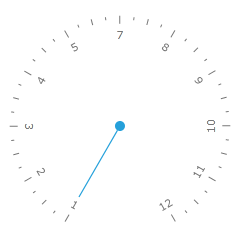 One of the gauges you can create with the RadGauge control, is a radial gauge. 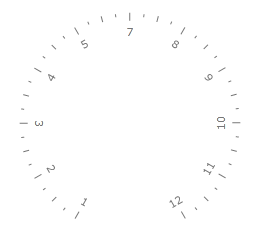 It is represented by a circle container with a scale in it. Additionally, it can display various indicators that point to a certain value on the scale. This topic will walk you through the creation of a sample application that contains a radial RadGauge. The radial gauge type is represented by the RadRadialGauge class. The RadRadialGauge control is used for wrapping radial scales. You can place one or more RadialScale objects inside of it. In order to define a scale inside the RadialGauge control you have to use the RadialScale control. 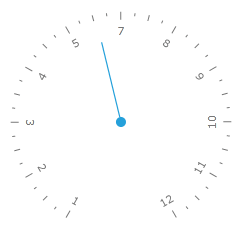 The RadialGauge works as an ItemsControl, which takes RadialScale controls as items. This means that you can have more than one scale inside the radial gauge. To learn more about the usage of the RadialScale control read the Radial Scale topic. The RadialScale control allows you to display different types of indicators that point to a value on the scale. To specify an indicator, use the Indicators property, which is of type UIElementCollection. This means that the Indicators property can hold more than one indicator. Example 2 shows a RadialScale that uses a Needle indicator to mark the current value as well as Pinpoint to mark the center of the Gauge.